Vice president says, "Our commitment to Poland is unwavering"
(CNN) -- Poland has agreed to host elements of the new U.S. missile defense plan despite initial surprise over the Obama administration's recent decision to overhaul President Bush's strategy. 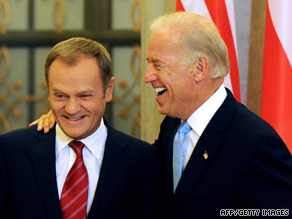 Polish Prime Minister Donald Tusk, left, meets with Vice President Joe Biden on Wednesday in Warsaw. "We are ready to participate in the project," said Polish Prime Minister Donald Tusk, who made the announcement Wednesday with Vice President Joe Biden in Warsaw. Biden said the United States was appreciative when Poland was willing to host an element of the now-scrapped missile defense plan proposed by the Bush administration and is grateful for its continued support. "We now appreciate that Poland's government agrees with us that there is now a better way with new technology and new information to defend against emerging ballistic missile threats," Biden said. Later, Biden met with Polish President Lech Kaczynski, who said "there are some difficulties" still to be discussed regarding missile defense, but there is hope those issues "will be resolved." Poland and the Czech Republic, both NATO members, agreed during the Bush administration to host major aspects of the missile defense system that would monitor and defend Europe from a possible missile attack by Iran. The Czech Republic would have had a major radar assembly, and Poland would have had defensive interceptor missiles along its borders. Russia was strongly against the plan from the start, claiming the missiles could be retrofitted with nuclear warheads, putting offensive weapons on its doorstep -- a claim the United States always denied. In September, the Obama administration said it would scrap the Bush plan because of new intelligence showing Iran was not close to acquiring a long-range intercontinental ballistic missile, against which the missile defense system was designed to defend. The administration laid out a new plan aimed at a more realistic threat of short- and medium-range missiles and would involve the use of ship-based interceptor missiles in the eastern Mediterranean Sea. There was much opposition to the decision in Poland, and a belief emerged that the new system was devised to curry favor with Russia. But top Pentagon officials have said the new missile system does not reflect a departure from previous goals and was not influenced by U.S.-Russian relations. In announcing the revised strategy, the Obama administration pledged that Poland and the Czech Republic eventually could still be involved in the new plan. In this case, the United States has asked Poland to host the Standard Missile-3, or SM-3s. "Our new phased adaptive approach to missile defense is designed to meet a growing threat not only to the United States, but first and foremost to Europe," Biden said. "It's going to meet it with proven technology that will cover more of Europe including Poland and will do it more efficiently than the previous system could have or did." The men both praised U.S.-Polish relations. "Our views are identical," Tusk said through a translator. Biden pledged U.S. commitment to Poland's security and praised Polish troops that have been deployed in Iraq, Afghanistan and the Balkans. "Make no mistake about it, our commitment to Poland is unwavering," Biden said. The U.S. vice president made other stops Wednesday in Poland. He visited the Warsaw Stock Exchange and the Warsaw Ghetto Monument, erected in memory of the Jews who rose up against the Nazis and those who were marched off to death.